Leukemia Fighter! (CML); I Am Dancing and Traveling My Way Through: What is Pleural Effusion and What Does it Feel Like? What is Pleural Effusion and What Does it Feel Like? 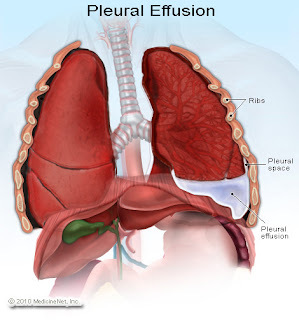 While the term “pleural effusion” sounds like a big scary word, in layman terms it simply means “an abnormal amount of fluid, around a lung.” The “pleura” is a membrane that lines the surface of the lungs, as well as the inside of the chest wall, outside the lungs. In pleural effusions, fluid accumulates in the space between the layers of the pleura. Typically, we all have approximately one teaspoon of watery fluid in our pleural space; which allows our lungs to move smoothly, in our chest cavity, when we breathe. A pleural effusion occurs when this fluid is increased. The actual condition of pleural effusion is not necessarily dangerous; typically, the danger is imposed, by the underlying cause. There are many serious causes for PE, but in my case, it is caused by my medication. Apparently Dasatinib, also known as Sprycel, is the culprit. My oncologist said that he often sees pleural effusion develop, when a patient reaches PRCU; this PCRU is determined, by a negative Polymerase Chain Reaction test. A negative PCR means that this particular blood test was unable to detect the BCR-ABL protein, in your bone marrow. This does not mean that you are “cured” but it does mean that you have reached the deepest, possible response to your medication; which is a good thing. This continued for several weeks, and I began to notice that I was short of breath going up our stairs, at home, too. Joe kept encouraging me to walk the loop, around our neighborhood, and I kept finding reasons not to. I could not even fathom walking down to the end of our drive way, let alone the two mile trek around the neighborhood. In some ways, I felt like a great big baby, looking back, I can’t believe that I was actually able to ignore the obvious signs, and never even consider that I was developing PE. I am really good at denying the fact that I have CML, and all of the side effects that go along with it. So, back to what it feels like, to have PE. The earliest and most obvious symptom for me was shortness of breath. The other symptom that developed over time and remains is a pain in my lower left, abdominal cavity. When I went to see my onc, I asked him if it could be my spleen, despite the fact that I didn't feel any enlargement. He promptly told me no, that it was PE. This pain has remained and hurts more when I yawn, or take a deep breath. It is a sharp pain, about three to four inches below my left rib cage, on the outer side of my abdomen, and into my back. It seems worse in the morning and is more noticeable when I lie down. The best way in which I can describe it, is that it feels like blister, full of fluid. You know that “full” feeling that a blister creates? And then, when I breathe, it feels as though I am pushing on that blister. It is more like pressure, than actual pain; the pain is caused by the pressure of expanding my lung, in a space that is now partially filled with extra fluid. If that makes any sense! Am I in any immediate danger? I do not think so; I can breathe, and I do not have a fever, so most likely, I do not have an infection. I have been off of Sprycel for two and a half weeks and there does seem to be some improvement in the shortness of breath; despite the fact that the pain remains, when I take a deep breath. So what now? It is my and my oncologist’s belief that I will be able to resume my medication, and control this pleural effusion. We also do not see any need to actively treat the PE, as we know the cause, and it does not impose an immediate threat to my health; it is mostly just a nuisance. I do not have congestive heart failure, pneumonia, liver disease, renal disease, lung disease, or any inflammation. I do not have a fever or an infection and truly believe that the procedure they use to remove the fluid, could likely cause me more problems that the actual PE. I am also one of those people that prefer not to take medications, unless absolutely necessary. People often die from the cure, not the disease; I think I will just wait this one out, as opposed to having a procedure that puts a tube into my chest and lung. Time will tell……. So, it all boils down to weighing the pros and cons; is the risk worth the reward? Is a little Pleural Effusion worth getting the upper hand on my leukemia and achieving PCRU? In my opinion, the answer is without a doubt; yes! HI, yes I had PE a few times so much so they took me off the drug. If I remember I had 5ltr bottles and over a month or so had 8 of those bottles removed. That is crazy, AND amazing!! And what an inspiration; 36 years with CML? Yes, this was written 3 years ago, and there have been many follow up posts since that time. I remain on Sprycel (5 1/2 years) and still deal with pleural effusions, which are usually resolved from a Sprycel break. My husband had the thorocentesis in late November and felt as your post said, relief in the ability to breathe. That was short lived though. This past Monday he had his follow-up with the pulmonologist and the fluid is back, but not as bad as had been just prior to drainage. You didn't say, so I assume you did not have to have this drained more than once. Sprycel does have him in remission right now. I want to let you know that I'm printing your posts and giving them to my husband for encouragement. He's become depressed and can no longer do much because of the breathing alone. I want to thank you for your posts, and your answer to my question in October. I hope your husband is doing better; I have continued to have thoracentesis procedures, but am still on Sprycel. I had three thoracenteses, at three different times, with a total of about a half-gallon of fluid removed. It was white and frothy, sort of like whipped skim milk, and it was weird to see it and know it came from my lung. The procedure itself is uncomfortable, but the relief was so great that I'd have it done in a heartbeat if I ever got PE again. But since I was taken off Sprycel and put on Tasigna I've not had any PE at all and am grateful.